I sometimes get informal requests from readers who want to buy our entire run of print magazines at a discount. I’m usually happy to oblige. 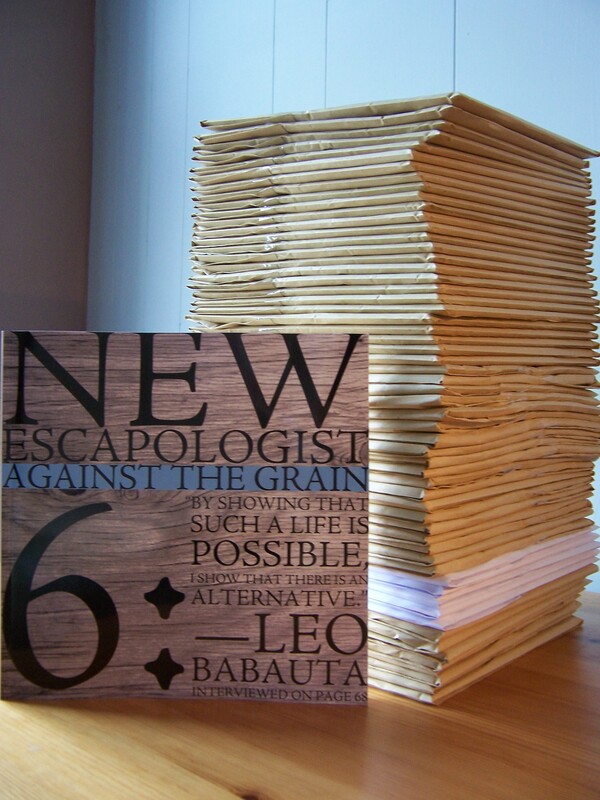 It’s an honour to find that people enjoy New Escapologist enough to want to acquire the whole run. The total cost of these offers will change as we bring out new issues. If you’re looking for discounts on specific combinations of issues, you can still just email us as before. Such bundles would, of course, make a half-decent Christmas, Hanukkah, or Festivus gift for yourself or for a loved one with escape on the brain. So, indeed, would anything from our shop. I just read Player Piano, Kurt Vonnegut‘s first novel. His trademark style is only visible if you squint and hold the book sideways, but it is still a splendid book and worth a read. There’s a problem with it though, and it’s a problem I see everywhere. It’s not really a criticism of the book or of the author, but of a commonly held idea trodden into the carpet of the society in which it was written. The story is set in a dystopian America in which tasks originally intended to improve quality of life have become automated. That is, machines take care of almost all manufacturing and service tasks. The only positions occupied by human beings are those in higher-echelon engineering and management, positions reserved for cherry-picked citizens of a certain IQ (and even these function beneath the tactical leadership of a supercomputer called EPIAC). The employed and unemployed seldom socialise. The unemployed majority either join the army or live invisible and aimless lives in an urban reservation called Homestead. In some ways, the book should have pride of place in the Escapological library. It’s protagonist, Doctor Paul Proteus, wants to escape his tedious career among the managerial caste and bring about something of a proletarian revolution. Great! His solution, though, is to destroy the machine society and to return to a state of employment for everyone. And here lies my problem with it. It is based upon the idea that to be unemployed is the ultimate disgrace. It is based upon the romance that primitive graft is the only place to find dignity. Well, it isn’t. If society were fully automated and human application were no longer required, we would find dignity in the new challenges: finding a way to support a society without mass employment, and ultimately finding something to succeed the consumer society. Given that unemployment in the Western world is increasing (due to automation or other factors) I think it is time we started thinking about it. Why can’t we be allowed to do nothing? Why is it not decent to be idle? Do we have the imagination to do something other than prop up a consumer economy? Can we, as a society, say “Good riddance” to grunt work – just as we saw an end to prepubescent chimneysweeps – and get on with something worthwhile, or at the very least, accept our bounteous inheritance as idlers? Thanks to regular reader François for showing us the logo of this year’s Buy Nothing Day. People escaping a barcode! Undoubtedly late to the party, I recently read and enjoyed The Spirit Level: why more equal societies almost always do better. The book is a fascinating body of evidence and a collection of intelligent suggestions about fixing the first-world problems of violence, mental illness, obesity, poor educational performance, teenage pregnancy, and barriers to social mobility. It is put forward that these problems can be tackled by addressing equality. Using data from twenty-three rich countries and fifty US states, the authors found that such problems are considerably more common in less equal societies. As the most equal, the Scandinavian countries and Japan tend to be at one end of the scale, while the US, UK and Australia are at the shameful other. Social problems, the book shows, increase with inequality. The political right are not fond of these findings (though David Cameron praised the book and seemed to take it quite seriously in its early days) and so various think tanks have emerged with the sole aim of debunking the thesis. Sensible debate should always be encouraged, but the think tanks don’t seem to engage very well with the evidence and instead focus on sewing seeds of doubt among those on the political right. This is a shame because we need the political right to get on board with this, or it’s a no-starter. Urgh. First off, the working class (and I suppose I count myself in that, even though I don’t actually work) are most definitely bothered by the earnings of celebrity footballers: it’s a popular conversation topic in the pub and the entire of tabloid culture is based upon a complex working-class relationship with such tall poppies. Secondly, whether members of the working class worry about inequality is besides the point: a person doesn’t have to know she’s drinking contaminated water to be made sick by it. This year’s riots in England were the result of people having no money in tough economic times, while simultaneously having their noses rubbed in the fact that they can’t have the material junk (read as lifestyles) that the rich have. Escapologists should be interested in social equality because once we’ve freed ourselves from the shackles of work, debt and urban lethargy, we might want to help a few other people to escape too. A Spirit Level-inspired better world would be a truly massive prison break. So please borrow The Spirit Level from the library, read it, and tell your pals about it too, especially the most Hitlerish of them. If you have blogs or whatever, there are various resources at the authors’ website to help get the word around. It’s the only way to counter the drivel from activists on the right.